I have always been fascinated by the impressive architecture and ornate interiors of stately homes and grand public buildings. My pet hates however, are frustratingly roped-off rooms, or doors marked ‘private’. September Doors Open Days in the UK are a godsend for curious, well frankly nosy people like me, allowing the public to see behind the scenes and to visit normally restricted access areas. On a memorable tour of Glasgow’s Citizen’s Theatre, I not only got to stand on the stage (major fan girl moment – I still regret not performing my renowned Desdemona dying scene! ), but I got to see the holy grail that is the costume department. Another of my favourites was a tour of the Royal College of Physicians and Surgeons in Glasgow – I do love a bit of blood and guts! I also have a weakness for large glossy coffee table books with the kind of pictures you can almost walk into, and I have several of these I use on a regular basis when researching settings. My new quartet of Regency marriages of convenience, working title The Wedding Planner, features stately homes galore. 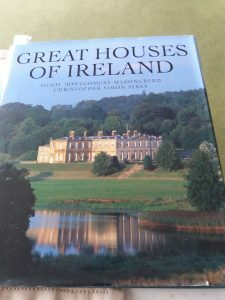 Because three of my four heroines are sisters from Ireland, I decided to plunder Great Houses of Ireland, which was a fantastic present from Alison L, a reader friend, for inspiration. 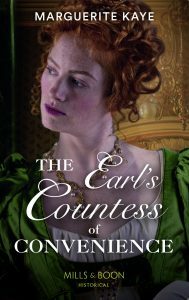 In this first book (* stop press – title just confirmed as, The Earl’s Countess of Convenience), Eloise, my heroine, comes to live in fictional Fearnoch House, a grand townhouse in London’s Mayfair which has just been inherited by Alexander, my hero. Eloise is a country lass who makes her own clothes and does her own dishes. 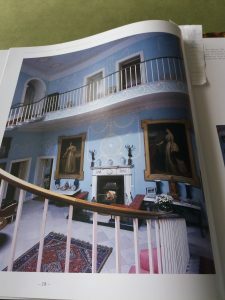 I decided that her new home would be as completely OTT as I could make it, so I introduced her to it with ranks of servants forming a guard of honour in the Reception Hall (borrowed from Russborough, County Wicklow), and all the way up the Grand Staircase. I read somewhere (and annoyingly, I can’t remember where) that footmen powdered their hair with a mix of flour and water and not hair powder, a disgusting mix that had to be applied every day. I also read (in the same book, whatever the blasted thing was) that some households called every footman James and every chambermaid Mary so that they didn’t have to bother remembering actual names. Eloise, my heroine, is not easily intimidated, and she has no truck with the Fearnoch family’s outmoded traditions, so I had her tell the footmen to stop powdering their hair, and start calling all the servants by their real names. Needless to say, they love her for it. So here is my own contribution to Doors Open day. 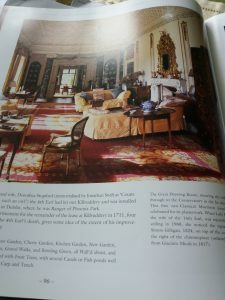 An exclusive whistle-stop tour of Fearnoch House, seen through my heroine’s eyes. Please feel free to step inside. Two hours later, each grand room was beginning to blur one into the other. Eloise had lost count of the number of drawing rooms and parlours she’d seen, and of the miles of corridors they’d walked, stairs they had climbed in order to do so. There was a gallery filled with painting by grand masters. There was a billiard room, a ballroom, several dining rooms, and many others with no obvious purpose at all, save to store quantities of outmoded furniture. Every room was elaborately corniced. There were clocks everywhere, chiming almost constantly. And they had explored neither the kitchens nor the bedchambers, nor the attics. The earls of Fearnoch were collectors of objets d’art, of curios, of furnishings and paintings, of anything, it seemed to her, that cost a great deal and was mostly useless. If you follow me on other social media, you’ll know that this book has been one of those painful ones to write. It’s partly because it’s the first in a new series, but it’s also because the marriage of convenience trope is really hard to get right – especially when your story is set at a time when there was no prospect of divorce. 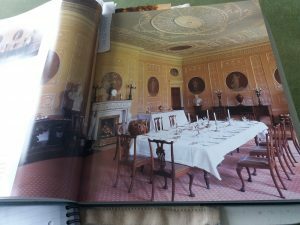 One of the many scenes which are now on my virtual cutting-room floor was a set-piece dinner on their wedding night in the Grand Dining Room (modelled on the dining room at Currahmore in County Watford, whose Grand Staircase I also borrowed). I spent ages crafting a beautiful, lush description of this room, which now makes only a fleeting appearance much later on in the story. The two rooms most used by my hero and heroine are the library and the ballroom. Fearnoch House library is their favourite room and mine too. 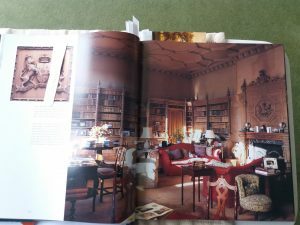 I ‘borrowed’ the library from Crom Castle in County Fermanagh, and I hope you can see from the picture why I loved it so much. 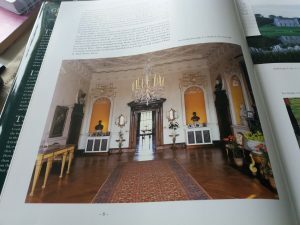 The ballroom, location for several pivotal scenes, including a first kiss, is actually the library of Bantry House in County Cork, but I think you can easily imagine waltzing down this gorgeous room. 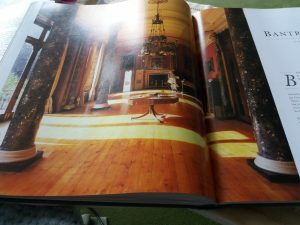 My hero gives my heroine dancing lessons here, and I finally got to use my own experience of learning how to waltz – nothing is wasted in an author’s life! I hope you’ve enjoyed this glimpse behind the scenes of Fearnoch House. Next up in the series, a new twist on the ‘secret baby’ trope, but fear not, the locations will be lavishly described. There are no roped-off rooms or doors marked ‘private’ in my imagination. Actually, that’s not true, but I’m not going to be blogging about that!!! 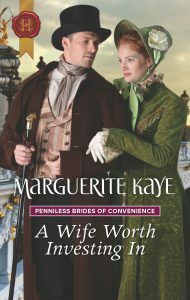 This entry was posted in Book News, History and Research and tagged The Earl's Countess of Convenience, The Wedding Planner. Bookmark the permalink.